Hello Thursday! 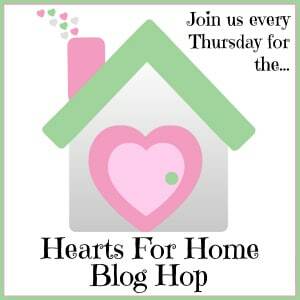 And Welcome to this week’s edition of the Hearts for Home Blog Hop! We have been having nearly 250 posts linked up at our party each week (be sure to click on the second page of posts – you won’t want to miss anything!) and I’m loving the variety. Homemaking, Gardening, Children, Marriage, Faith, Crafts, Recipes . . . the list goes on and on. There’s a little something for everyone. I fell head over heels for these Crafts with Maps from Pat and Candy. I’m looking forward to trying this Bubble Experiment from PreK Pages with my grandkids this summer. And who can say no to this Easy Chocolate Mousse from Life Over C’s? Not me! I’m tucking these Christ-Centered Easter Crafts for Kids from away for future use, although we might sneak in a couple of these between now and Sunday. If you’ve never thought about making a rag rug, you’ll want to read what Kim posted in our blog hop last week – Reasons to Make a Rag Rug. And a Special ShoutOut for Kim who’s brand new ebook launches today! And Now, For This Week’s Blog Hop! We love spreading the ideas you share with us every week – it’s the place to come for encouragement and inspiration in cultivating Hearts for Home. I hope you find time to visit and spread the Hearts for Home Love this week. Did you know nearly dozen bloggers co-host this party every week? You can meet them all <here>. Thank you so much for featuring my Christ Centered Easter craft ideas for kids, and also for hosting!! We have done a couple of the crafts here in my house, my kids love doing crafts so this list was perfect. I hope you and your family have a blessed Easter!! You are most welcome, Nicole 🙂 I am happy to have a few more quick and easy ideas to keep my younger ones busy. Glad you’ve joined our party! Easter Blessings to you and your family!